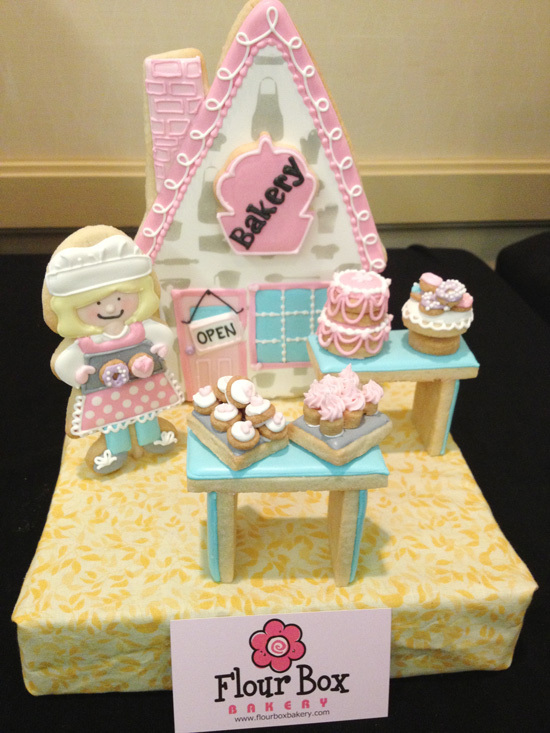 Last month I spent a fun weekend in Salt Lake City for Cookie Con 2014! Cookie Con is an international cookie decorating convention and show, and this year’s event was the second annual event. Last Cookie Con was in the fall of 2012 and I had the pleasure of being one of 6 presenters that year. You can catch up on Cookie Con 2012 (here). This year, I attended Cookie Con as a vendor and had a booth set up to sell my book, Glorious Layered Desserts. It’s taken me a while to share a post on Cookie Con 2014 partly because I’ve been overwhelmed as to how to possibly share such a big/fun/special event in one blog post! I’ve finally concluded that it’s impossible to fully describe what it’s like to spend the weekend with 450 fun, kind, talented people from all over the world who all share a common interest… cookie decorating! Simply put, it’s an amazing experience! 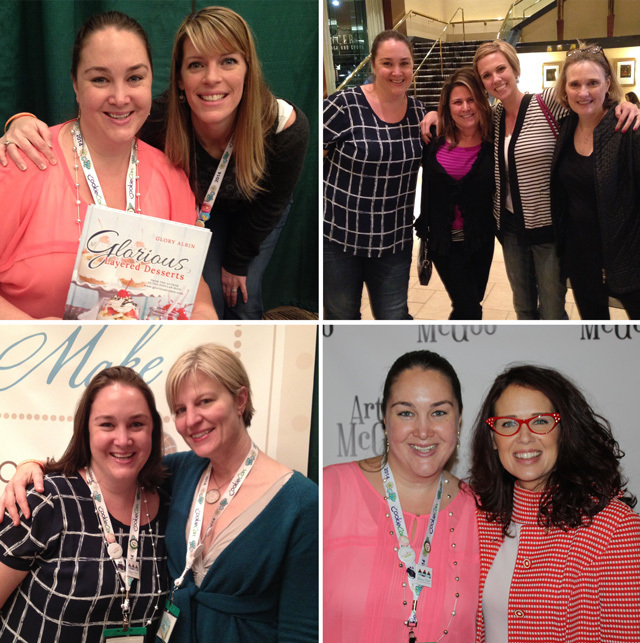 So this post is merely a teeny tiny snippet of Cookie Con! 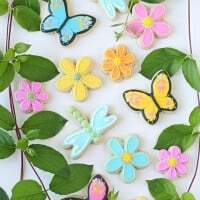 If you are a cookie decorator, or have any interest in cookie decorating at all, you can find all the details on this amazing conference on CookieCon.net. Cookie Con is the brainchild of Karen and Mike Summer of KarensCookies.net, two of the most amazing, hardworking, organized, generous people I’ve ever had the pleasure of getting to know! (top left) I loved meeting Anne York of Flour Box Bakery! Anne was one of the instructors this year. I snuck away from my book signing table for a bit to sit in on one of her classes. (top right) I enjoyed traveling with my friend Bethany of Auntie Bea’s Bakery, and we enjoyed a really wonderful dinner with the owners of Ribbon by Design. (bottom left) I had the pleasure of getting to know Julia Usher at the 2012 conference and I thoroughly enjoyed spending time with her again this year! (bottom right) The sweet and talented Liz Adams, aka Arty Mcgoo! Liz and her husband John were the key note speakers at this years conference and it will be near impossible for anyone to ever top their opening night address/entertainment! Here’s a peek at what they put together for us (my favorite is the Party Rock Anthem). On the outside, Cookie Con is about the art of cookie decorating… but I think any attendee would agree it’s really about the people! Meeting new friends, and spending time with old friends is always the highlight of the weekend! But of course there are LOTS of gorgeous cookies!! Below are photos of just a small portion of the amazing cookies in this year’s Sugar Show. There were several different categories, ranging from “Home Sweet Home” (cookies to represent your home), to “Anything Goes”. Although their are prizes given for the show, to me it’s more of a gallery than a contest. It’s just so incredible to see what everyone brings to the table! The variety of techniques and styles creates such an amazing display!! The collection of cookies below were created at Cookie Con (versus the Sugar Show cookies, which are brought from home already decorated). 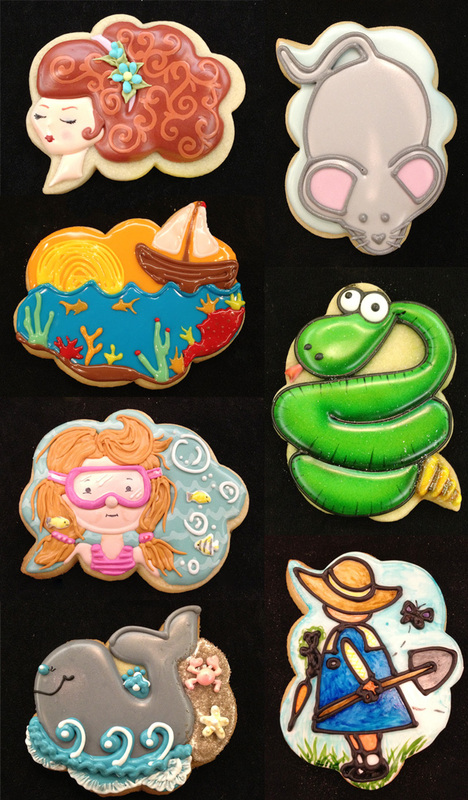 Each of the cookies below was decorated on the same shaped cookie cutter… a mystery shape! The mystery shape was decorated as part of a contest. 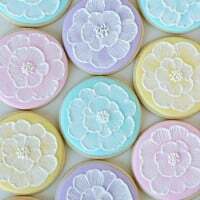 The cookies may be decorated any way you like, and it’s not revealed what the cutter’s original shape/purpose is. Can you guess the cutter? Did you figured out the cutter? It’s a thought bubble! Isn’t the creativity super inspiring?! In addition to spending time with “cookie friends” and enjoying the amazing Sugar Show display, Cookie Con is packed with learning! This year’s class instructors were… Georganne of LilaLoa, Anne of Flour Box Bakery, Angela of Oh, Sugar! Events, Amber of SweetAmbs, Myri of Chapix Cookies, and Susan of The Painted Cookie. Liz Adams – Arty McGoo, and her husband John Adams were the key note speakers. I only had time to attend a couple classes (between selling books), but I heard wonderful things about each class! And as if gorgeous cookies and gorgeous friends aren’t enough to fill the weeked… there was a vendor room filled with “sweet” vendors selling an array of cookie cutters, pretty packaging supplies, ingredients and tools! The complete list of vendors and sponsors from this years event are listed HERE. 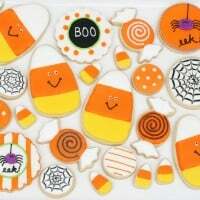 Cookie Con is always such an amazing event and certainly should be on your “must attend” list if you have any interest in cookie decorating! 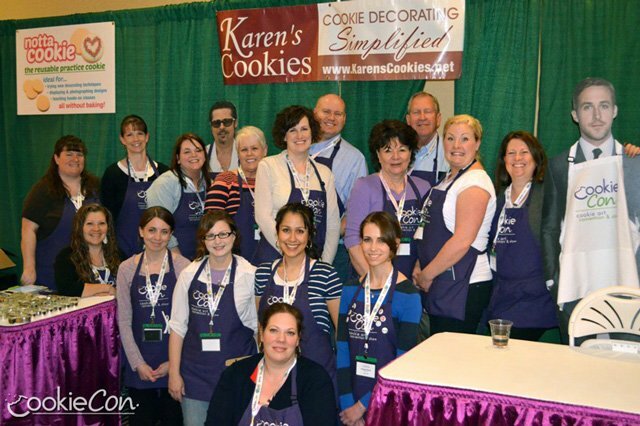 Thanks again to Mike and Karen of Karen’s Cookies for creating such a special conference! Looks like an awesome time. Thanks for sharing! Wonderful, Glory! Thanks for the memories! Oh wow, these aren’t cookies.. this is pure art. Beautiful! Who could eat that?! Too pretty to eat… We should have a cookie con over here too. What a great idea. 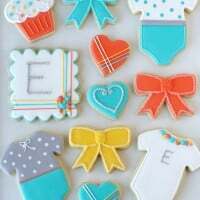 These are such awesome cookies, the details on some of them are amazing!!! Those cookies are amazing! Serious works of art! I’m so glad you had a nice time! The baker at the beginning is my favorite. I would love to visit her bake shop! Love you! Aww so humbled to see my little mouse hiding along all these other awesome cookies! Was wonderful getting to meet you as well!! Great article ! Brings back memories of all the fun!